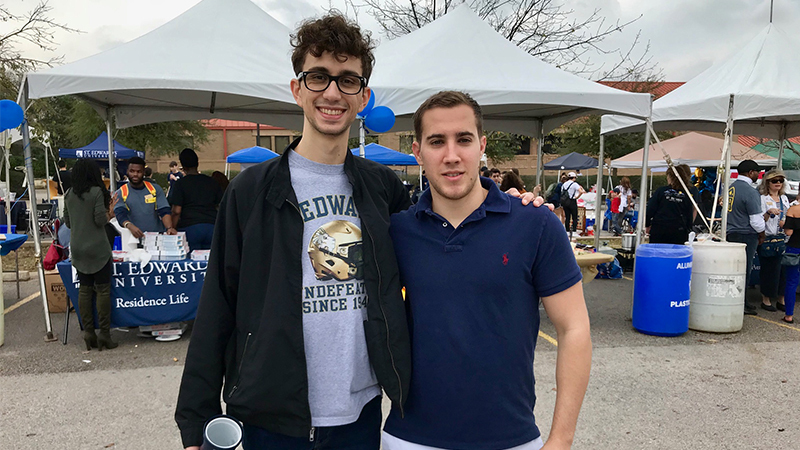 When Josh De Freitas needed to find a career mentor for a project in Professor Catherine MacDermott’s Business Communication class, he tapped into a relationship he had built through Apprentice Austin. He had been meeting with the mentor, a Charles Schwab trading specialist, periodically for nine months. But when Professor MacDermott sent the students a spreadsheet of potential alumni mentors, Josh immediately took advantage of the opportunity to find another connection and build his network. He scrolled through the document and found Paul Tramonte, the executive director of commodities compliance at J.P. Morgan’s Houston office. Paul had graduated from St. Edward’s University in 1991 with a bachelor’s degree in Accounting and had spent over 23 years in the energy and investment banking industry. Josh knew that he wanted to connect with Paul, but he wasn’t sure if an email would do the trick. When he approached Professor MacDermott with his concerns, she suggested making an introduction. That night, Paul emailed back. Three days later, Josh decided to make the trip to Houston and meet Paul in person for lunch. The trip opened doors for a mentor relationship that has helped Josh navigate his career options. "I was kind of reluctant to send him an email," Josh said, "but he’s been so helpful. Any question I have, he’s been guiding me. When I should apply for jobs. I also spoke to him about grad school." As an international student from Trinidad, Josh has to consider his career plans in terms of visa restrictions. Paul’s advice has helped Josh understand the industry’s recruiting cycle and application process. Between his Charles Schwab connection and his alumni mentor, Josh has built a brain trust in his field of interest, but he still finds time to cultivate relationships with faculty – just by attending office hours. Josh makes it a habit to stop by and ask his Finance professors questions about classes and careers. During the fall and spring semesters, he has even assisted Dr. Camelia Rotaru with research and says he’s learned more through that process than in some classes. Meeting regularly with Dr. Rotaru has allowed Josh to grow professionally. He is motivated to take advantage of the St. Edward’s University network and stand out from his peers. "Just going the extra mile, going out to Houston to meet someone. It’s something that other people wouldn’t do," he said. This ability to try new activities and meet new people – without a fear of failure – has propelled Josh to join student organizations and sports clubs, with no experience or connections. During his freshman year, he began swimming at the UFCU Alumni Gym pool to avoid working out in the Texas heat. 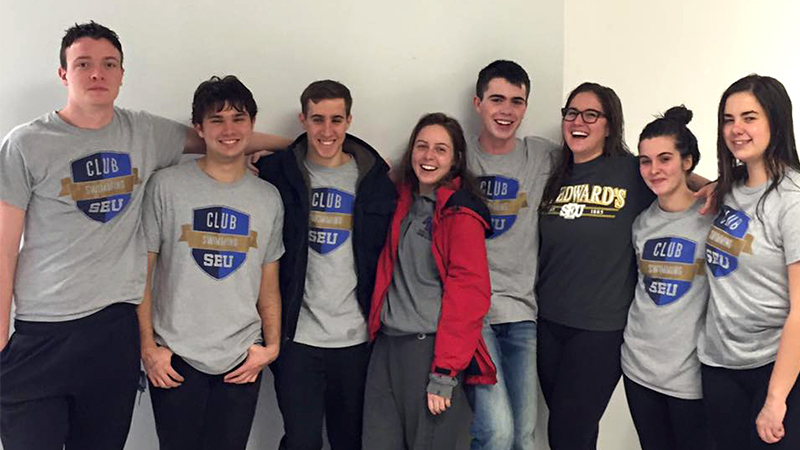 The St. Edward’s University swim team president noticed his natural athleticism and convinced him to join the team. By his sophomore year, Josh was president. He traveled with the team to compete in Dallas, Waco and San Marcos. But in order for Josh to stay focused on his classwork, he decided to give up swim team involvement and start joining organizations that reflected his career goals. Josh became a member of the Financial Management Association (FMA) and made friends with the officers. His willingness to help out and step in immediately made him a shoe-in for his current role – vice president. 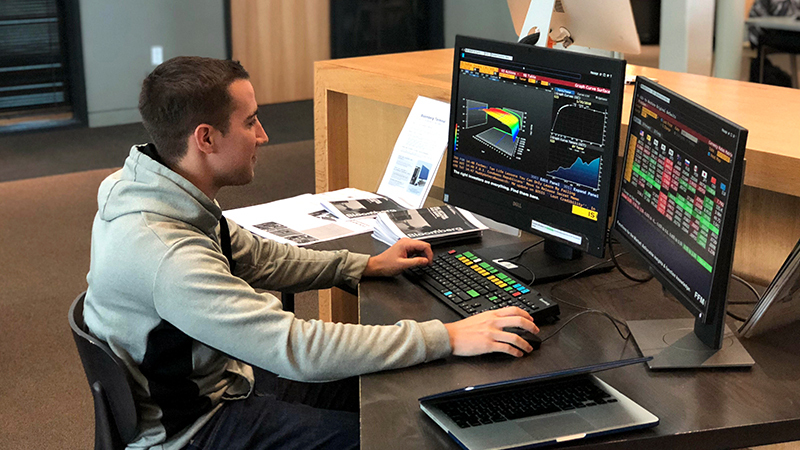 During his tenure, the organization has welcomed the arrival of a Bloomberg Terminal to campus, hosted speaking engagements with venture capitalists and facilitated tutorial sessions with financial experts. "I think people at the end of the day just go straight home and don’t worry what campus has to offer," he said. "Being a part of the FMA, you get really close to people." Between coursework, FMA meetings, research projects and networking, Josh is also active with Campus Recreation, traveling to Colorado on three separate ski trips. After graduating in spring 2018, Josh will begin a full-time role as a research associate at Mission Hill Investment Advisors, where he will be conducting equity research and portfolio construction. The private wealth management firm is located in downtown Austin.